If any of you ever meet Patrick in person, he tells you two things. No. Make it three: (1) he’s vegetarian but loooves cheese, (2) he needs to eat a lot (like a minimum of 4,000 calories) before he withers away (lucky him), and (3) he loves tea. I covered fact number one at Hearth, fact number two is supplemented with my food gifts to him (Mitzy’s macarons from Tafu, Bouchon Bakery’s peanut butter cup, and Momofuku Milk Bar’s cookies) and whatever he ate earlier in the day, and now I’m taking care of number 3. Since that evening was really cold and ridiculously windy, we seek refuge to the nearest tea house from Hearth the my mind can come up with – Cha’an. Going up a flight of narrow stairs from the entrance, it felt like we were transported to a different place. 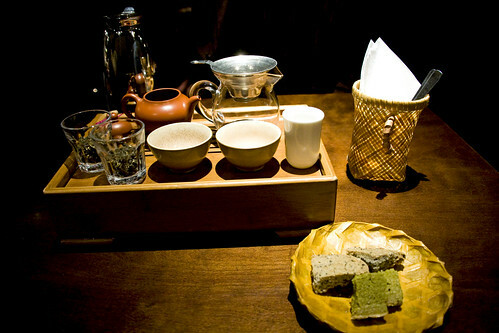 It’s zen-like yet casual and lots of conversations carried around in this small tea house. 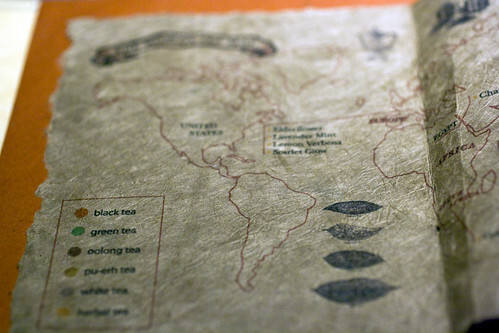 You can tell it’s very tea-focused when you flip through the pages of the menu. 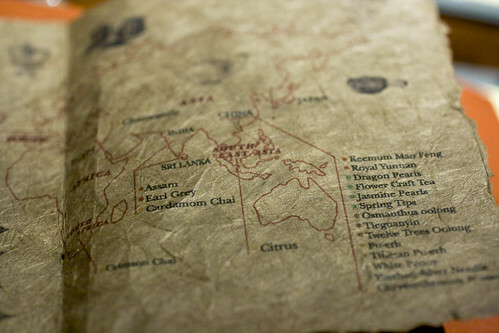 Especially with the worn pages of the world map indicating what region the tea comes from. After the few minutes of demonstration and the actual serving of the oolong tea, Patrick and I were amused how it went and chatted on the highlights of this entire ceremony. Tasting a sip from my dainty tea cup, this oolong tea was very delicious. It’s fragrant with a hint of floral musk and I like the bitter to sweet flavors of the tea. This was enjoyed immensely. The plate of shortbread cookies were pretty good. All were crumbly, buttery and not too sweet. 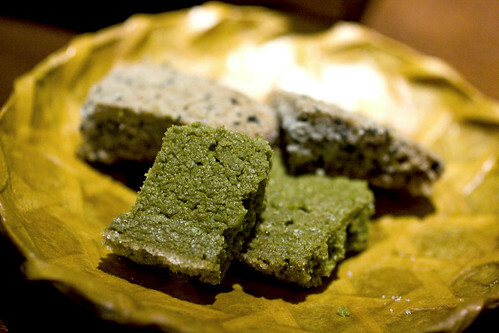 The two flavors offered were green tea and black sesame. The one that tasted better was the black sesame because of its inherent nutty flavor when it’s toasted. 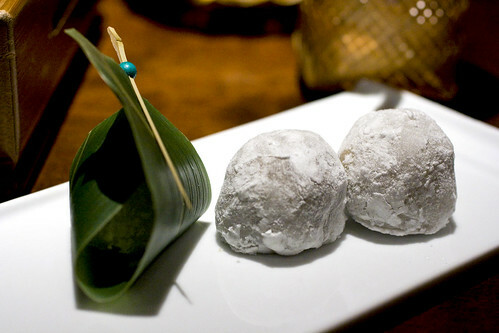 Back when Patrick and I were discussing online, prior to his visit to NYC, I’ve asked him if he ever tried the lovely Japanese confection, mochi? He replied to me that he hasn’t, I’ve urged that we shared a plate of Earl Grey Tea-Chocolate mochi. 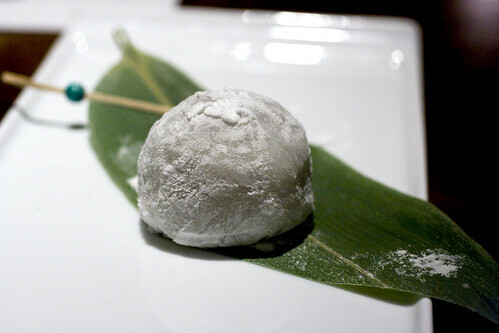 What I love about mochi (in case you never tried it), is it’s soft, chewy rice cake exterior and the subtly sweet filling (usually the red adzuki bean paste) meshes so well together. 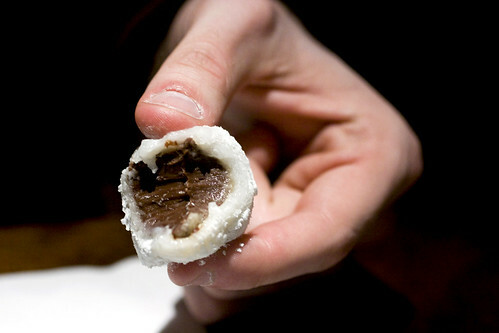 Getting to the point, Cha’an’s version is about as addictive as Minamoto Kitchoan‘s chocolate daifuku. The difference between the two, Cha’an’s rice cake exterior is softer, almost pillow-like, obviously, there’s no cocoa powder rolled on it, and the chocolate filling does have a hint of Earl Grey tea flavor. After eating the mochi, we’ve lingered around – drinking more tea, chatting and catching up. I was just here 3 days ago. Love it. Their black sesame creme brulee with black sesame ice cream was really good too. Alex: I heard their creme brulee (or generally speaking, their sweets) are their forte besides the tea. I have to go back there. Someday. Walked by that place many times and it always looks swanky. 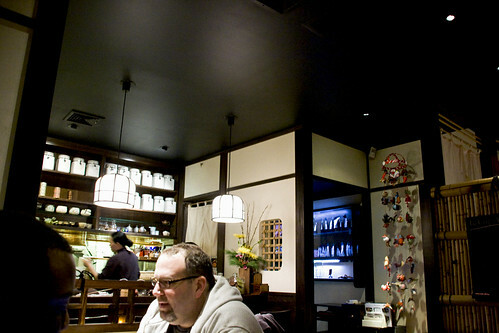 I guess my brain associates Japanese teahouse with swank… so the idea of high prices have always kept me away. Is it an everyday kind of place or a once in a while kind of place? Danny: I guess I can understand your thought that Japanese = swank = $$$$ but it’s not terribly expensive. In terms of prices, it can be an everyday thing like a pot of tea with multiple savory food bites (possibly a full course?) would go for $16. I haven’t ventured a lot to this place but after this experience, I do want to go back. i love frozen mochi! they are the best. Helen: It’s not frozen mochi, my dear. I’ve yet to try this place. I had an opportunity, but lost it. Btw, how much was the meal? Thanks. Earl grey mochi? Sounds like a winner in my book. OMG, awesome! I’ve only been once before when it *just* opened. Looks like I need to go back!